South Korea Inside Out/Australia Inside Out: Are Korean Students Respectful To Their Foreign Teachers? I have often been surprised by the amount of reports I hear from fellow English teachers who think that Korean students are disrespectful, difficult to teach, and are generally not very nice. I say surprised because this is not the experience I have had with Korean students at all, but maybe my perspective and expectations of Koreans students is a little different. Before I left for Korea, I had the impression that some of my friends thought that I was doing a really noble thing teaching English in South Korea, it was almost like I was doing Koreans a favour just by going there to work. Nothing could really be further from the truth; I didn't have many job prospects in England and although the adventure of a new culture excited me, the major motivation was the money. Some other friends assumed teaching in Asia generally must be an easy job, with their respect culture and hard-work attitude. They thought all I needed to do was speak and they would listen. Combine this with TV programs showing volunteers teaching in countries like Thailand, Cambodia, and India and word of mouth experiences from such endeavours, where students are attentive, smiley respectful, and sweet and one can get the impression that this teaching malarkey in Asia is easy and rewarding. Perhaps this is what many assume when they first come to Korea. I came from a slightly different direction, however. I had taught science in England as a trainee teacher for one year. I hated it, and although the students were a challenge, it was not for this reason; the job took up my whole life, mostly with bureaucratic nonsense but also I never agreed with how my country went about teaching young people, however this is another story. I also had quite a lot of experience working in a school environment as a learning assistant and science technician. I had first hand experience about just how tricky young people in school can be. I was already well practiced in handling disrespectful, noisy, and naughty young kids. English students gave me plenty of chances to refine my skills in dealing with them. I came to Korea with an open mind, I had no real idea what to expect but I did have some expectations that Korean students would be better behaved. 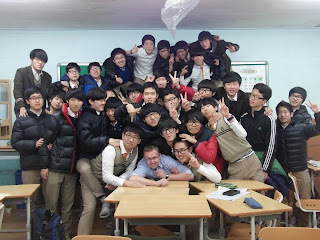 After about three years teaching in Korea, I still think they are better behaved, more respectful, and generally much more friendly and pleasant to teach than students back home. However, it has not slipped by me that many people who comment on the behaviour of Korean students are themselves also teachers back home in their own countries. I am pretty sure that when they say their students back home are more respectful they are not lying, so what is going on? Is it only English students who are difficult? - The NET may not have the full support of their school, i.e. many schools in Korea have far greater trust in their pupils than the foreign teacher (and it shows sometimes). These are all factors that are not comparable to back home; we speak the same language, our classes have importance, we are qualified, we have the support of the school, we usually know what is happening on a day to day basis, most teachers stay in their jobs for longer periods of time, and we are in control of our classes (the students answer to us). If we turned the situation on its head and had Korean teachers in Western schools, speaking little or no English and stumbling around in many situations without the full support of the school, it would be carnage for them, at least from my perspective as a teacher in England. The fact is that this will never happen, and if there were Korean native teachers in our schools they would receive a hell of a lot more support and assistance than we do. Much of the respect issues many of us have are more to do with the school's attitude to foreign teachers than the actual student's attitudes, which in my mind are pretty darn good considering the circumstances. Further evidence of this, for me personally, came from my first two jobs in Korea, both Hagwon (private school) jobs. The first was great, a well organised school who put trust and responsibility on their foreign teacher and who also had a sensible and well thought out behaviour management strategy. As a result of this the students were a pleasure to teach and I rarely had cause to discipline them. My second job, however, was a completely different story; a poorly run Hagwon with a horror boss who was overly obsessed with his own importance and power and who went through Korean and foreign teachers alike, like the daily pots of Ramen he slurped noisily away at everyday. The students knew the boss had no respect for his employees and there was no strategy for coping with unruly children. My classes, because of this, were a complete nightmare. My students oozed contempt for me out of every orifice and I had to work extremely hard to make my classes tolerable while receiving absolutely no assistance whatsoever from my boss. My experiences with these Hagwons very much confirm what I suspect, that it is the system and the schools that are the problem, not the students, they can be won round eventually, however bad the school might be. There is another factor and that is the everyday life of a student in Korea. 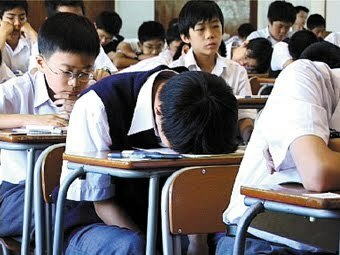 Koreans students are saturated with education, pressure from parents, and exams. Many of my high school students are at school for 14 hours a day and, unbelievably, some even have to go to a Hagwon (private school) after this as well. Middle school and Elementary students have less time at school but, again, many go to Hagwons after school. When it comes to our classes, is it any wonder they see it as an opportunity to have a little sleep or a break from the monotony of their other lessons and mess around and have fun in them. I have a great deal of sympathy with them as I am pretty sure that, back when I was a kid, I would have taken exactly the same chance for a rest. The combination of student hardship and the lack of regard the schools (and the education system as a whole) have for NETs makes it completely understandable why some find their students are not giving them the expected level of respect. All the actions of the schools and the Korean education system is saying NET's classes are not that important and the over-worked students read this message loud and clear. We earn our monthly wage by overcoming this attitude and earning their respect. Fortunately, we are interesting, especially compared to most of their Korean teachers. We are interesting by nature because we are different and many of us work quite hard to make our lessons interesting as well. Add a consistent behaviour management strategy, some patience, and understanding and we can win them round. Like most young people everywhere, get beneath the exterior of posturing, bravado, and showing-off to friends and you have great youngsters in Korea, who are naturally compliant and respectful and one of my great highlights of living in Korea.